The Chevrolet Tahoe is a full-size SUV from General Motors. 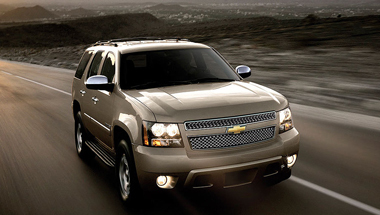 The Chevrolet Tahoe offers cargo space, passenger accommodations, and towing capacity. It's a full-size truck and handles like one, offers the versatility of real low-range four-wheel drive, while delivering a good ride and a pleasant interior. The Hybrid model gets decent mileage in the city and the standard version is a better highway-cruiser value. With room for up to nine passengers, V8 power and plenty of available amenities, the Tahoe has impressively matched the wants and needs of large American families. 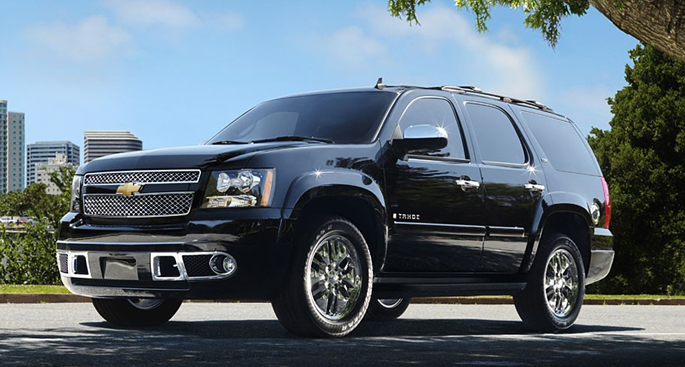 The Chevrolet Tahoe is a traditional full-size SUV built on a truck platform. The expected three main trim levels of LS, LT and LTZ are available. The LS is well equipped with dual-zone climate control and full power accessories. Going with the LT or LTZ fills out the standard equipment list with more luxury-oriented items. Towing capacity is up to 8,500 pounds. Based on a platform similar to the Suburban and Silverado models, the Tahoe makes a stable rig for pulling trailers. Ample power comes by way of a 5.3-liter V8 (now E85-compatible) with 320 horsepower, matched to a modern and efficient six-speed unit. One result of the streamlined body is optimal fuel economy, according to GM. Automotive engineers judge wind-cheating aerodynamics by a factor known as the coefficient of drag: The lower the number, the easier air flows over it. The Tahoe has a Cd of 0.36. The Hybrid is even more slippery, with a Cd of 0.34. However, total drag also includes frontal area, and the Tahoe's substantial frontal profile means it isn't as low-drag as a much smaller vehicle with a slightly higher Cd. There is a choice between two- and four-wheel drive. 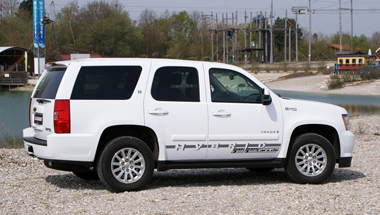 The Tahoe Hybrid has a 6.0-liter V8 of 332 horsepower and a two-mode hybrid system, and works seamlessly. It offers drastically improved urban fuel economy and slightly more power compared to other models, but tows less, and weighs more. EPA ratings for the Hybrid are 21/22 mpg City/Highway. In 2000 a 2WD Tahoe Limited was produced for demand purposes. The Tahoe Limited offered several features, borrowed from other GM SUVs. First and foremost, was the Z56 "Police Package" suspension/performance package first shown to the public at the 1996 Detroit Auto Show. The new Tahoe was made in green and blue, but production was limited to one color only - Black Onyx Metallic. The Limited had no roof rack, but was equipped with a distinctive body kit, along front and rear fascias and some Chevy Tahoe Accessories. Heavy-duty ABS brakes were borrowed from the Chevrolet Suburban. Bilstein 46mm shocks, front and rear anti-sway bars (borrowed from the Z71 Tahoe 4x4), a 4-speed 4L60E transmission (with transmission cooler), a 3:42 rear gear ratio, limited slip differential and an oil cooler rounded out the performance features standard on the 2000 Tahoe Limited. The two-tone leather interior, a 120 mph gauge cluster, an all black car grille, Pilot fog lights set in the front bumper, and an L31 5.7L Vortec V8 (tweaked to achieve 130+ mph) were among the standard features in the Tahoe Limited. The cabin materials are finished well and fit together with tight tolerances. With the available leather upholstery, the look is upscale; the lighter colors look more luxurious, the black is very businesslike. Small items storage space is abundant, with a large center console, map pockets in the doors, a big glovebox and a handy tray below the center stack.